We’re not gonna lie: the world is a scary place. There are diseases, famines, impending environmental catastrophes, violence, war, and (shudder) reality TV. We’re running out of fish in the oceans, for goodness sake! Yeesh. The oceans! We got pretty scared even writing that list. Now, we know that dressing up like Freddy Krueger for Halloween can’t undo the real-world fright fest. But we say...if you can’t beat ‘em, join ‘em! 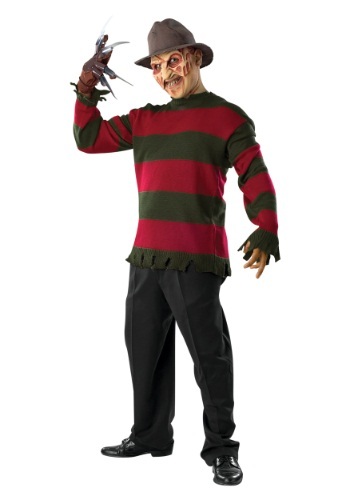 Scare the living daylights out of your pals when you arrive in this Deluxe Freddy Sweater with Mask. After all, Freddy just wants to say hello by waving his clawed glove. He just wanted to runs his claws through your hair, too. Right? He promises to be gentle, just whatever you do... don't fall asleep. Freddy can't control what happens once you slip off into sleepy land. Freddy probably won’t have the urge to tear you to shreds! Right? This sweater and mask combo will make you instantly recognizable as the iconic Hollywood villain. And at least when you’re dressed as Freddy Krueger you will be hard-pressed to find someone out there scarier than you. Phew. You’re safe...for tonight. The hat and gloves pictured are sold separately, but the mask is enough to make us all duck for cover. This officially licensed look is officially terrifying. Bravo. We have to go hide in a cave in Antarctica now.